Just because a fight doesn’t take home all sorts of awards, honors and palpable recognition, doesn’t mean it wasn’t good or even great. On odds alone, it’s probable that there are untelevised matches all over the world that would overwhelm the system with adrenaline — fights few know or care about aside from the fighters and some immediate family, that are nonetheless outstanding. In 2001, Micky Ward vs. Emanuel Burton took home “Fight of the Year” honors by almost everyone, including Ring Magazine. But another bout on ESPN’s Friday Night Fights that season was a perfect storm of leather, canvas and ego. Julio Cesar Gonzalez was 25-0 (14 KO), and Julian Letterlough was 15-0-1 (15 KO). Both preferred to move forward and keep their punches free flowing, both had respectable power, and both lusted for wins in the face of danger. Letterlough’s two fights prior to the Gonzalez fight in February 2001 — against Sam Ahmad and Max Heyman — had been televised, and he was quickly gaining a reputation as a feared puncher. 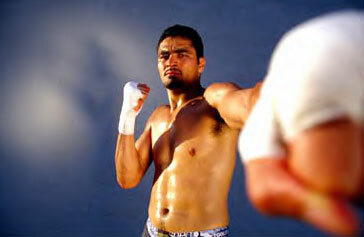 Gonzalez was being constructed as a fighter on slightly lower-level cards, though. Outside of his community, he wasn’t very well known. Action unfolded the only way it could: with plenty of collisions and force. In round 1, a right hand put Letterlough down, and Gonzalez continued to rock “Mr. KO” back on his heels repeatedly, but walked through a dangerous assault to get it done. In round 3, Letterlough landed his own right hand with Gonzalez preoccupied with offense. Gonzalez rose, though carefully, and resumed the attack. The 5th round again demonstrated why Letterlough was not to be trifled with, as a left hook bounced off Gonzalez’s noggin and sent him down for the second time in the bout. And again Gonzalez climbed to his feet, but this knockdown was a bit different in that Gonzalez looked rocked. His oft lurching style and forward momentum helped clear his head, though, and he was able to smother a lot of Letterlough’s work while getting his legs back over the next round or so. But make no mistake, there wasn’t much let up. Both men threw. And threw. And got wobbled. And threw some more. By the 8th and 9th rounds, these pugs were growing arm weary and exhausted, and as Gonzalez attacked recklessly in round 10, another right hand wheelbarrowed Gonzalez onto the canvas, and this time he was clearly hurt. Gonzalez’s drunken sailor impression for the remainder of the round saw him to the bell, and amazingly, he came back to send Letterlough reeling and down in the 11th with a poppy combination. The clinches became a tad more frequent in the 12th round, both men drained of energy, water and wherewithal. But the action was still vaguely primal. And when it ceased, Julio Cesar Gonzalez emerged victorious. Gonzalez would go on become the first Mexican light heavyweight champion by defeating Dariusz Michalczewski in 2003, his zenith, while Letterlough was greeted with disappointing results thereafter. In 2005, Julian Letterlough would be gunned down from behind in his hometown of Reading. In 2012, Julio Gonzalez was struck by an oncoming car while on his motorcycle, succumbing to his injuries.